Steve Gelder being presented with the EBP Award. 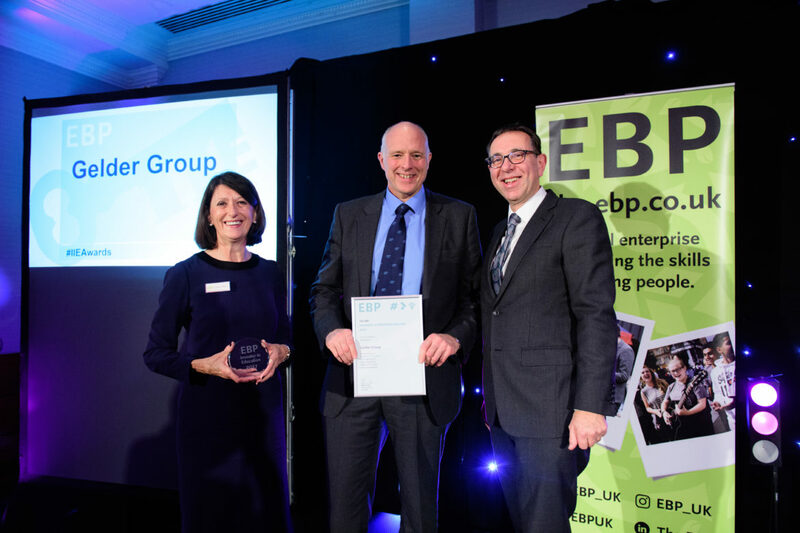 The EBP (Education Business Partnership) recently recognised businesses from across Lincolnshire for their exceptional work with schools and young people at its annual Investors in Education Awards, held at Belton Woods Hotel in Grantham on 28th November. Each year The EBP invites schools to nominate organisations to receive an Investors in Education award. Gelder Group was one of the employers that stood out and went the extra mile to help the young people it worked with. Gelder Group received the award for their fantastic support in making sure students gained knowledge of the construction trade at Lincoln Construction Week – a three-day interactive event held in October, organised by the Lincoln Group Training Association and supported by The EBP. It’s well known fact that there is a huge skills shortage in the construction industry and at Gelder Group we are committed to increasing the number of people within the industry and to training the next generation. We are honoured to have received this award acknowledging our contribution to education in the region and look forward to continuing our work in 2018 with young people who have an interest in construction. Steve Gelder was presented with a trophy and certificate at the awards by The EBP’s chief executive, Elaine Lilley, and James Pinchbeck, marketing partner at Streets Chartered Accountants. Our work would not be possible without the support of the local business community. We thank all of the organisations who have supported The EBP this year and are pleased to celebrate those that have been recognised as making a significant difference to schools, young people and the community. Gelder Group is a multi-award-winning construction company based in Lincoln which works across a range of sectors including education, health, retail, insurance, leisure, commercial and residential building projects. The firm, which employs 300 staff and is a founding member of the Gainsborough Career College, has trained 300 apprentices since its formation as a two-man building outfit in 1988, 37 of those in the last three years alone. If you would like more information about our work with schools and young people, please get in touch.